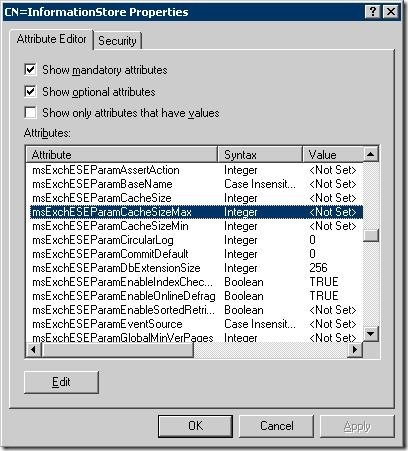 Note (6apr2011): Setting the MsExchESEParamCacheSizeMax only doesn’t produce the required result as of Exchange 2010 SP1. For more information on how to limit the database cache size in Exchange 2010 SP1, see Limiting Exchange 2010 SP1 Database Cache. I received a question from someone implementing Exchange 2010 who was surprised to see Exchange taking up all available memory. This is because in Exchange 2010 (2007 as well) memory allocation is dynamic, contrary to Exchange 2003 and earlier versions where, depending on the situation, you had to fiddle around with boot.ini switches like /3GB to make memory available to Exchange. Also, the maximum database cache size was limited in Exchange 2003 to around 1.2 GB due to virtual address space limitations (see MSKB 815372). The main reason Exchange 2007/2010 claims memory for its database cache is performance. The more memory is assigned to the database cache, the less I/O’s are generated because things can be dealt with in-memory and the database cache becomes more effective. When a certain amount of transactions has been reached, changes will be physically written to databases (so far they’ve been stored in-memory and written to transaction logs). This limit is called the log checkpoint depth target. Since Exchange 2003, the log checkpoint depth target is 20 MB databases. As of Exchange 2007, for configurations existing of 2+ database copies, the depth target is 100 MB for active copies and 5 MB for passive copies. This means, after 100 MB of transactions changes will be physically flushed to the database. The more changes are delayed (i.e. stored in-memory and in transaction logs), the chance of overlapping changes or combined writes increases lessening I/O’s required. Note that to lessen the time to fail-over, passive copies have a lower depth target making them commit changes more often, minimizing the log files to replay after a fail-over. Right-click InformationStore, and edit msExchESEParamCacheSizeMax. Set it it to the number of pages to maximize the Database Cache to. Note that Exchange 2007 works with 8 KB pages and Exchange 2010 with 32 KB pages! Restart the Microsoft Exchange Information Store service for the change to become effective. So, for instance, if you want to limit the Database Cache to 4 GB of an Exchange 2010 server, set msExchESEparamCacheSizeMax to 131072 (4 GB = 4.194.304 KB / 32 KB). If you want to limit the Database Cache to 2 GB of an Exchange 2007 server, set msExchESEparamCacheSizeMax to 262144 (2 GB = 2.097.152 KB / 8 KB). Note that lowering these values may degrade performance, in terms of server performance as well as in terms of end-user experience. However, smaller organizations with a limited number of mailbox users may benefit because they don’t let Exchange claim significant amounts of memory which it will never use. This entry was posted in Exchange 2007, Exchange 2010 and tagged Cache, Database, Exchange2010, Memory by Michel de Rooij. Bookmark the permalink. Hello, we have tried it. On Exchange 2007 it worsk perfectly, but on 2010 it doesn’t. Do you have any ideas, how to diagnose it? After editing, did you allow sufficient time for AD replication before restarting MSExchangeIS or the server? What does the “MSExchange Database(Information Store)\Database Cache Size (MB)” counter max out on? Yes, there was a lot of time. It is more than one week ago, and many restarts of MSExchangeIS has been done. The setting does not seem to work with 2010 SP1 installed. Needless to say this is terrible given that SBS2011 ships with SP1 loaded. yes , I have SBS2011 Also , and doesn’t work , ..
anyone have another solution for it ??? still using the full memory in my server. SBS2011 here also. ADSIEDIT parameter set, multiple reboots and 2+ weeks later, STORE.EXE still consumes all available memory. thank you for the important post, but i didn’t understand the following msExchESEparamCacheSizeMax to 131072 (4 GB = 4.194.304 KB / 32 KB) so let’s say if i wanna set the cache to 4GB shall i put 4194304 in the msExchESEparamCacheSizeMax. Then number used is the number of pages; the cache size is determined by the page size used by the product. So, if you want 4 GB for Exchange 2010 (page size 32kb), you should use the value (4 GB = 4 * 1024 * 1024 = 4194304 KB and divide that by the page size = 4194304 / 32 = 131072. If you’d enter 4194304, you’ll set the page size to 4194304 * 32KB = 134217728 KB = (134217728 / 1024 / 1024) = 128 GB. so I made a mistake as i entered the 4194304 value i will correct it to 131072 which is enough for exchange 2010 sp2 20 users, right ? This grab all the memory behaviour causes issues with proactive monitoring tools as most will alert at a set memory threshold. We use 90% as a critical threshold but with Exchange 2010 you may as well not monitor it. I set msExchESEparamCacheSizeMax to 196608, expecting it to use about 6 GB of RAM but turns out that it is only using about 800 MB, I have Exchange 2010 SP2. Is there a way to check the page size? Worked for me. great article! I have an Exchange 2010 box which normally consumes a full 20GB of RAM, and I find that this behavior chokes some other services I have running on the box and makes the whole thing go very sluggish. I’ve decided to restrict it to 16GB, so I’ve used 256 for msExchESEParamCacheSizeMin and 524288 for msExchESEParamCacheSizeMax. However after 3 full days it now only uses a bit more than 1GB RAM. Has anyone else seen this behaviour? Does anyone know what might be causing it? I have the same problem, did you get this figured out? Good article. But I gave the value (16*1024*1024)/32 to the max value and (4*1024*1024)/32 to min value and memory use is now 512Mb. When no values are entered it was 18Gb? 65536 and a Max Size of 524288 after over a week it is just above the min Cache size of 2.2GB Exchange 2010 SP2 Is it using the min as the max? has anyone figured out what the issue is? Figured it out thanks to this post. made me look like a hero! thanks for this post worked fantastic!! Life saver. This was an excellent article as well as the hyperlinked followup for SP1. My excessive memory use was a red herring and I almost made a huge mistake. If I had not read this article first, I would not have known that 64GB of memory will net 44GB of memory usage by store.exe. The issue I was having when I noticed the memory consumption was a VMware issue addressed by a patch. Thanks for the save man. Definitely following this blog now. I’m lost when it comes to ADSI Edit. Not seeing —> Configuration > Services > Microsoft Exchange > > Administrative Groups > > Servers > > InformationStore. I am on a SBS2011 SP1 server. File > Connect to > Naming Context : Configuration > Services (in the tree) > ..
Hi Michel, We have ex2010 sp1 installed with 32 gb physical memory and we also have this issue always physical memory 30 gb utilised. We have only one server with all roles installed and have 240 user mailboxes and about 50 shared mailboxes. Sometimes we are not able to open EMS and EMC also because of this. What is the recommended size you would recommend for database cache. I set my max to 851968 (26 GB) and my min to 262144 (8 GB), but now store service never uses more than 16 GB. Before it was using 32 GB out of 48 GB that the server has and would get to 32 GB in less than a day. Now it has been running for a week and hasn’t crossed 16 GB. I would like it to use full 26 GB since server has plenty of RAM. Any idea/suggestions?